On Navratri 2011, Goddess Saraswati descends on this Earth plane in her ferocious form to destroy the demon of ignorance. Saraswati Puja restructures your thoughts to give you divine intelligence. Ma Saraswati or Goddess Saraswati who represents unpolluted consciousness, destroys the demons of negativity and ignorance that causes suffering in this whole world. Goddess Saraswati or Ma Saraswati is most widely known as the Goddess of Education. She is the Goddess of Science and Technology and the Goddess of Innovation and Design. She will bring in new understandings and technologies beyond our present thinking that will uplift all of Humanity on Navaratri 2011. This will deepen our faculties and open us on spiritual level. Ma Saraswati is depicted either sitting on a white lotus or riding a white swan. In North India, she is shown with a peacock. The white lotus symbolizes supreme pure knowledge while the swan symbolizes grace and the power of discrimination. The peacock is the secret of Om. Goddess Saraswati has four arms which represent the four aspects of human personality in learning: i.e. mind, intellect, alertness and ego. In one hand Ma Saraswati holds the Vedas which represent the universal, divine, eternal, and true knowledge as well as her perfection of the sciences and the scriptures. In another hand she holds a crystal rosary or mala, representing the power of meditation and spirituality. In the third and fourth hands she holds a musical instrument called the veena, representing her perfection of all arts and sciences. Goddess Saraswati is the Goddess of Wisdom, learning, intelligence, skills and creative arts. She wants to inspire others to excel and stimulate creativity in the world. Ma Saraswati, one of the first Goddesses to be mentioned in Ancient Indian texts, is considered to be the Mother of the Vedas. 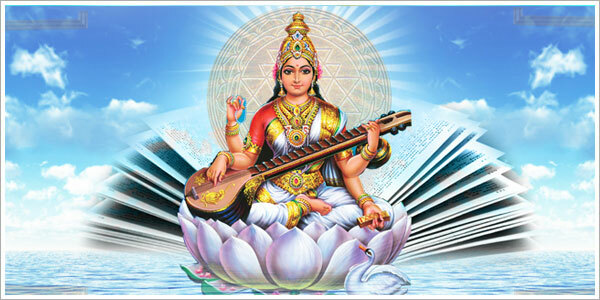 Ma Saraswati is the Goddess of Speech and is also known as Vag-Devi, the Goddess of Divine Sounds. She is worshipped on the final 3 nights of Navratri festival. Saraswati Puja on Navratri 2011 will help you restructure your thoughts to give you divine intelligence. Goddess Saraswati on Navratri 2011 will destroy the demon of ignorance and will grant us knowledge and divine wisdom. Her energy is essential for discrimination, academics and performing arts and worshipping Goddess Saraswati on her 3 power nights of Navaratri 2011 will bless you with perfection of all arts and sciences.